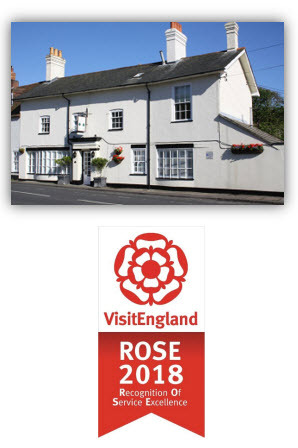 Mark and Sarah Clayson, owners of The Bay Trees situated in the pretty village of Milford on Sea, are delighted to have been awarded the coveted 2018 VisitEngland Rose Award in Recognition Of Service Excellence. This VisitEngland award is given annually to just 100 VisitEngland quality assessed accommodation businesses that go the extra mile in order to provide excellent customer service. This award that can only be won once. Nominations for this award are made following the annual VisitEngland quality assessment and the observations of the assessor. Other evidence, including online customer reviews, is taken into account. The final judging panel also look for innovation that sets the business apart. This includes facilities or services offered to make the guest’s stay really special. The awards were announced today at the Independent Hotel Show taking place at Olympia. The Bay Trees, an elegant house, which dates back to the 17th century, is steeped in history; over the years the former village “Poor House” has been home to a number of owners and trades including a drapers shop, lodgings, guest house, bank, restaurant and latterly a successful B&B. Mark and Sarah moved to the iconic Bay Trees in August 2011 and have worked hard to achieve the top commendation from Visit England – Five Stars, Gold Award and Breakfast Award – The only B&B in the New Forest to attain these awards. They are also listed in the esteemed Alistair Sawday guide, 'Special Places to Stay'.